Google+ Hangout is a cool feature of Google+, social network by Google launched back in June 2011. In initial phase, Google+ saw good growth with millions of sign up in less than a month. Later, the growth rate went down. Google is not in hurry and it is pushing more and more features slowly. Most attractive feature of this Google+ was its video chat called Google+ hangout. This chat service allows users to video chat with 9 friends simultaneously. Later, Google has added more cool animations and sound effects. Users can also make calls direct from Google+ hangout. 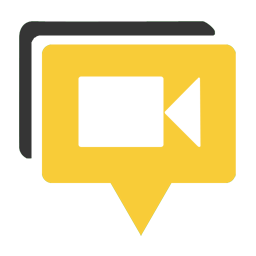 Users can also AIR their hangout to broadcast on YouTube. Last month, Google has also replace Gmail video chat with Google+ hangout. And all Gmail users need to have a Google+ profile before using the Google+ hangout feature. This was an attempt to push all Gmail users to Google+. Google has also added a feature to adjust bandwidth usage. In this post, I am adding few tips of Google+ hangout that will help you to get most of this nice video chat service. Important Facts About Google+ Hangout. 10 users can simultaneously Hangout. If a user is inactive, it will have 150 minute check-in to make sure he is still there. For best hangout experience you need to have 1 mbps/1 mbps (up/down) internet connection for one on one video chat. If you want to have group hangout, you need to have 1 mbps/2 mbps (up/down) internet connection. If we talk about minimum, You can enjoy hangout at 256 kbps/512 kbs. But it will lag and disconnect again and again. Now, there are many ways to start a hangout. You can use any of the given methods. 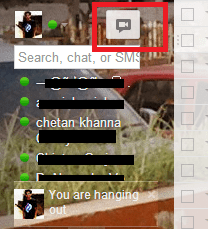 If you are on Gmail, you can start hangout by clicking on hangout icon near chat box. If you are on Google+, you can find hangout inside more option in left side bar menu. 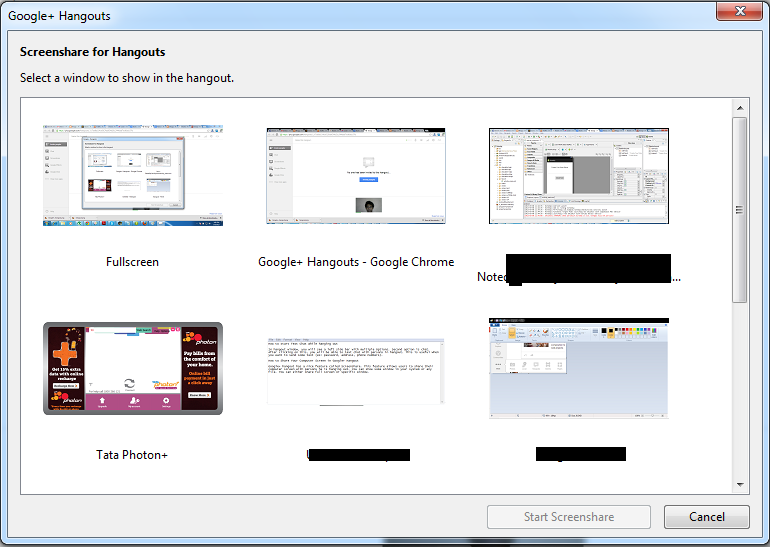 In hangout window, you will see a left side bar with multiple Options. Second option is chat. After clicking on this, you will be able to text chat with persons in hangout. This is useful when you want to send some text (ex: password, address, phone numbers). Google+ hangout has a nice feature called Screenshare. This feature allows users to share their computer screen with persons he is hanging out. You can show some window in your system or any file. You can either share full screen or specific window. Google added Google Effects app in Google+ Hangout. It allows users to add some visual effects and items in video. For ex: you can add hat, glasses, drum and many other these kind of objects in video chat. Users can share and edit documents while hanging out. This feature is really helpful when two people are working on same project but locations are far away. 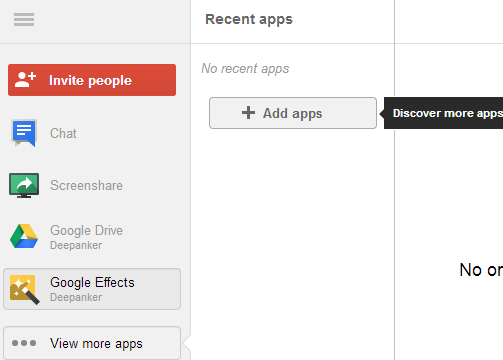 In Google+, you can add much other kind of apps to add more features. You will see an option View More Apps at left side bar menu. Click on it. Scroll the box and look for YouTube app. Add YouTube app to hangout. It will ask permission to access your Google Account. Allow access if you want to use this app in Google+ hangout. 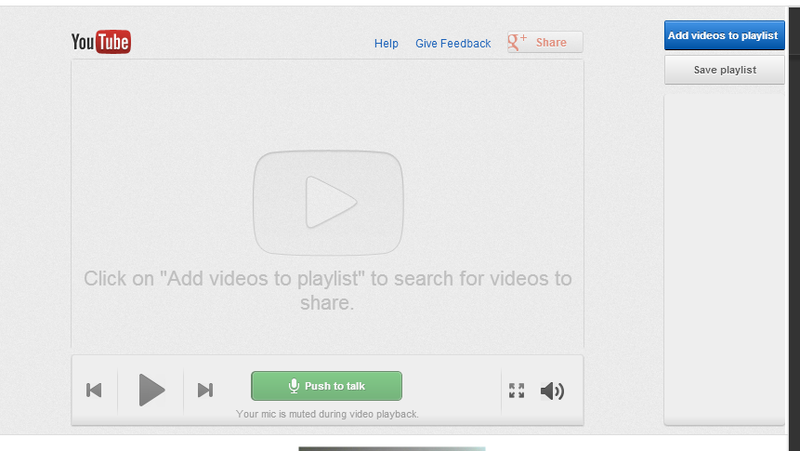 Now, click on Add Video to Playlist at the top right corner to add video in hangout. Hangout on AIR is nice feature of Google+ hangout to broadcast your video chat for free via YouTube. You can also watch hangout of other people too. 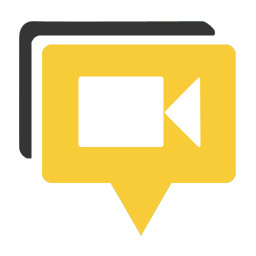 Follow this link to create or join a Hangout on AIR. There are many other things which you can do with Google+ hangout. Add more apps and enjoy more cool things in Google+ hangout. Do you like Google+ hangout? Share your experience and views with us via comments.